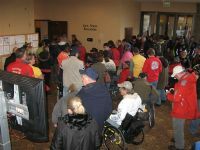 SNOWMASS VILLAGE, Colo. — Deputy Vet­er­ans Affairs Sec­re­tary W. Scott Gould called on more than 350 dis­abled vet­er­ans last night to strive for new heights as they par­tic­i­pate here this week in the 25th Nation­al Dis­abled Vet­er­ans Win­ter Sports Clin­ic. Speak­ing dur­ing open­ing cer­e­monies along­side Vice Pres­i­dent Joe Biden and Dis­abled Amer­i­can Vet­er­ans Nation­al Com­man­der Wal­ly Tyson, Gould praised the suc­cess of what has grown to become the world’s largest dis­abled win­ter sports event. Dis­abled vet­er­ans arrive for open­ing cer­e­monies of the 25th Nation­al Dis­abled Vet­er­ans Win­ter Sports Clin­ic at Snow­mass Vil­lage, Colo., March 27, 2011. The clin­ic, joint­ly spon­sored by the Vet­er­ans Affairs Depart­ment and DAV, uses recre­ation as a reha­bil­i­ta­tive tool for vet­er­ans with dis­abil­i­ties rang­ing from spinal cord injuries and ortho­pe­dic ampu­ta­tions to visu­al impair­ment and neu­ro­log­i­cal con­di­tions. As they learn adap­tive alpine and Nordic ski­ing and get intro­duced to rock climb­ing, scu­ba div­ing, trap­shoot­ing, curl­ing, snow­mo­bil­ing and sled hock­ey dur­ing a five-day pro­gram, the vet­er­ans’ eyes get opened to a whole new world of oppor­tu­ni­ty. “It is all about redefin­ing pos­si­bil­i­ties in the life of a seri­ous­ly wound­ed vet­er­an,” Gould told Amer­i­can Forces Press Ser­vice. “This set of events here is all about cre­at­ing that moment where a vet­er­an looks up at the hill and feels in the pit of their stom­ach, ‘I don’t know if I can do this,” whether because it’s a whole new expe­ri­ence or a first return to the moun­tain with a dis­abil­i­ty. “It is all about the cama­raderie and the team­work and the coax­ing and the safe­ty and the train­ing and coach­ing that leads that per­son to get in the chair­lift for the first time and go to the top of the hill,” Gould said. Those lessons, he said, will remain with the par­tic­i­pants long after they leave Snow­mass Moun­tain and the Nation­al Dis­abled Vet­er­ans Win­ter Sports Clin­ic. Tyson relayed his own expe­ri­ence par­tic­i­pat­ing in the clin­ic and its pow­er in help­ing dis­abled vet­er­ans focus on their abil­i­ties rather than their dis­abil­i­ties. “You will face chal­lenges,” he told the group, warn­ing that they’re like­ly to come away from the expe­ri­ence tired, sore, and per­haps even with a few bruis­es. “But you will come out of it stronger in every pos­si­ble way,” Tyson said. Biden made a sur­prise appear­ance at last night’s open­ing cer­e­mo­ny. The pre­vi­ous day he’d thanked the hun­dreds of vol­un­teers and staff mem­bers that work to make the sports clin­ic a suc­cess. Snow­mass Vil­lage rolled out the red car­pet to the par­tic­i­pants, host­ing the annu­al “Taste of Aspen” as the event kicked off.